Amongst the five extant "Sergeants" in Singapore, the Studded Sergeant is the largest member of the genus. A typically forest-dependent species, the Studded Sergeant is usually observed singly. Like its other cousins, it is usually observed gliding around a few favourite perches, stopping with its wings folded upright, or opened flat when sunbathing. Males are sometimes encountered puddling at damp forest paths and sandy streambanks. It is the only species that has "studs" or black spots within the series of post-discal white band on the hindwings. The early stages of the Studded Sergeant has been recorded on Ilex cymosa and documented in detail here. 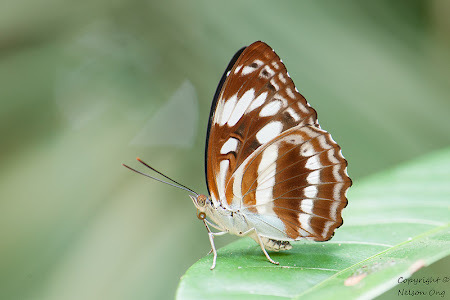 This individual, showing its ochreous brown undersides, was shot by ButterflyCircle member Nelson Ong.